Popsicles are always a good idea, right? 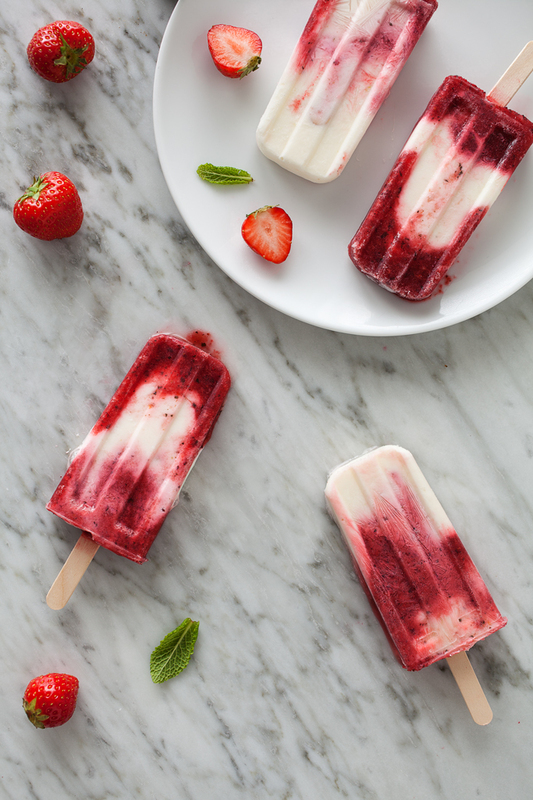 Especially these beautiful and delicious Strawberry Mojito Popsicles. I made mine with addition of rum, so they have a real "mojito" taste, but if you want to made them non-alcoholic, the rum can be easily omitted. 1. In a blender combine strawberries, mint, 1tbsp honey and 1tbsp rum (if using), blend until the mixture becomes smooth. Set aside. 2. Mix yogurt, zest and juice of lime, 2tbsp honey and 1tbsp rum (if using). Taste. If you want it sweeter, add a little bit more honey. 3. Spoon alternate layers of yogurt and strawberry mojito mixtures into each mold until they are filled. Insert popsicle sticks to the molds and freeze until solid, about 4-6 hours or overnight. 4. To un-mold the popsicles, hold the mold in a warm water (don't let the water go over the top edge) for about 10-15 seconds.